For as long as I can remember, my hair has been long. Like, long-long. A little bit weird-long. But not long ago, a pal on my basketball team challenged me to a deal: if I cut my hair and donate it for wigs for cancer patients, she’d do the same! I’d been wanting to do this for a while, but not really put much thought into it. It always feels a bit of a waste when I trim my hair… And I do suppose I take having long hair for granted; I know I’d be gutted if ever I lost it all. So when I received the challenge, I went for it (probably to my friend’s surprise…)! Earlier this month, my pal and I met before basketball practice, and another friend on our team who is a hairdresser chopped it all off for us! The following morning, I put it in the post for Little Princess Trust. So proud! Every little bit counts and happy that my annual haircut can finally be put to good use. =) Will definitely make a habit of this in the future. Added bonus: While we were getting our hair cuts, another basketball team’s practice ended, and some of the parents and such wanted to contribute (even though we never even thought to take donations or anything!) – and our pal who cut our hair let us donate her fee as well – so we were even able to give money to Little Princess Trust, as well as hair. Double win! EDIT: Got lots of nice confirmations from Little Princess Trust about our donation! Thank you for your donation. We’re sending it straight to The Little Princess Trust so you’ll be making a difference very soon. 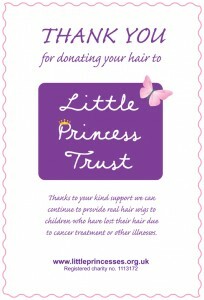 A big thank you from the Little Princess Trust! Rest assured your donation will go towards helping us to continue to provide real-hair wigs to boys and girls across the UK and Ireland that have lost their own hair through cancer treatment and other illnesses. On behalf of everyone connected with the charity, thank you again. You have made a difference and your contribution is very much appreciated.